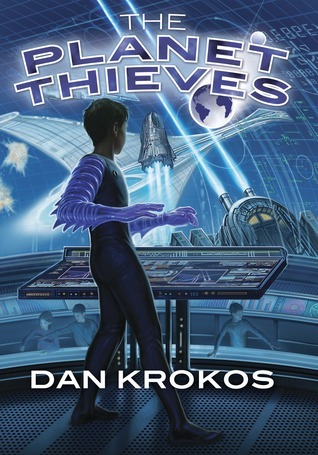 Today, we’re pleased to be kicking off the official blog tour for The Planet Thieves by Dan Krokos! As a big fan of the author’s False Memory, I was very eager to read his first middle grade sci fi adventure, which follows a 13-year-old cadet named Mason Stark, who is aboard the space ship Egypt when it’s attacked by an alien race called the Tremist.When the ship’s captain is killed, and with most of the crew out of commission, Mason must find a way to rescue the survivors–and to find out why the aliens attacked in the first place. This book is described as “Star Trek meets Rick Riordan,” and I can tell you that the first reference at least is dead-on. From the language to the situational danger to the physical setting and items, Trek fans will find that this world seems like one they’ve visited before. While some readers may quibble about that, there’s a certain comfort in that sense of familiarity, since I felt acclimated to the ship and objects and procedures pretty quickly. Right in the center of the screen, two Tremist crouched in their magnificent armor. It resembled plate, like knights in ancient Europe once wore, but this was not dull hammered metal–the surface of the Tremist armor shone weirdly, like oil, shifting colors depending on the angle. Their helmets were the worst parts–the face was a perfect oval, the shape a normal face would be, but it was a pristine mirror, so to look at a Tremist head-on, it was said, you saw yourself. The last thing you saw was the terror on your face. A perfect image of your head, floating atop a Tremist body. I mean, WOW! How awesome is that? I will say that I felt that the many flashbacks often interrupted the flow of the story, and I wish that we’d gotten more of a sense of the way Mason feels about things. There are some pretty cool scenes later in the book that I won’t spoil, but even ones like that might’ve felt a bit more immersive if we’d had more of a sense of being there with him and experiencing what he felt. Still, this is a fun read overall, with tons of cliffhanger chapter endings to ensure you’ll be turning the pages to find out what happens next. I’d recommend this one specifically for readers in the book’s target age range of upper middle grade or younger YA, who will likely find the quick pacing and action-packed story an easy and entertaining read. The Planet Thieves will be out on May 21, 2013. The series has already been optioned for film by Warner Bros. and HeyDay Films, the outfits responsible for the Harry Potter film franchise. You can also read the first chapter of the book and find out more information on its official website. Win a copy of The Planet Thieves! Thanks to our friends at Tor Teen, we’re giving away a copy of the book before it’s released in stores. Just leave us a thoughtful comment below letting us know why you’d like a copy of the book (remember, we’re recommending this one mostly for non-adult readers), and fill out the Rafflecopter form. Open to US and Canadian residents aged 18 or older, or 13 and older with parental permission. (Parents should fill this out for younger kids.) Complete rules are on the Rafflecopter form. Good luck! I’m most excited about reading this book because I’m a huge fan of sci-fi and it sounds amazing! I love sci-fi books so I would really like to read this book. I love sci-fi book so I would really liek to read this book. The sci-fi vibe is what attracts me to this MG. I’d love to read it. This book sounds awesome! I’m excited to see more MG science fiction I think there should be a lot more of it! Looking forward to picking this one up. Aw, I love hearing that parents are reading the same books as their kids. :) Thanks for stopping by! I LOVED False Memory and follow Dan on Twitter – he’s hilarious. I’m quite excited to see how The Planet Thieves turns out. If I like it as much as I liked False Memory, he’ll be on my must-read authors list for sure. I have FALSE SIGHT sitting on my shelf and I’m trying my very best to ignore it, since there are other books releasing first, hah. I wanted to read Planet Thieves for the same reason you did–I hope you enjoy it, fellow Trekker! Thanks for the giveaway Wendy! Sure thing, Savy! This might be a fun one to read with your son. It’s been far too long since I’ve read a good MG book. Sometimes you just need to read something as a kid, y’know? Besides, I know loads of kids I could recommend this to, and I love that. There’s nothing quite like recommending BOOKS for young, impressionable readers and kids. We need more readers to join our ranks! YES. I don’t read nearly as much MG as I do YA, but really good MG books are the ones that really capture my heart in a way that YA usually can’t. And yes, let us breed more readers! The world can always use more critical thinkers and dreamers. First, I love the cover. Second, I love young adult MG books! I always have :) I’m willing to read any MG book that sparks my interest–which this definitely has! Thanks! I can so visualize the kids who would be fighting over this book! Cliffhanger chapters really are wonderful for my more reluctant students. I want to read it too! I agree with you in theory, Claire, which is why I still read across all age groups, including picture books. I think it’s hard for younger books to be age-appropriate and engaging while still appealing to older readers, though–I find that the younger the age the book is aimed for, the pickier I am about it. I hope you enjoy this one, though! I haven’t read False Memory yet, but this post reminds me that I need to get on that! Great review. When I was a bookseller, the “books for boys” question came up a lot. Girls seem to be more willing to read books with male protagonists, while a lot of boys prefer not to read books with girl ones, generally speaking. It’s good to see male YA/MG authors and protagonists for sure. Sounds like a good gift for your cousin. :) And yes, definitely give FALSE MEMORY a go sometime, too! I just got False Memory in the mail but I haven’t had a chance to read it yet. This sounds just as cool. I particularly like the description of the Tremist helmets, so creepy. Thanks for the giveaway. Oh, that’s awesome, Carl! FALSE MEMORY was a really nice surprise to me, and I think most fans of action-oriented scifi enjoy it. Hope you enjoy both that and this! I’m not big on MG but this does sound good! I started False Memory a couple weeks ago but had to put it aside for review books. :( I do get to see the author at a local event this weekend though! Thanks for sharing, Wendy! I hope you enjoy False Memory when you get around to finishing it–and have a great time at the event! I hear Dan is a lot of fun in person. My son would love this from what I have read (he’s 12). Ah, he’s the perfect age for this book. :) Good luck with your contest entry! I think my son would love reading this book! I did not know about the film option – way to go, Dan! I actually missed seeing that announcement as well, so it was exciting to see it on the press materials! Really happy for him as well. I rarely read MG, but this sounds really interesting! I was sold from “Star Trek meets Rick Riordan”–a phrase that I think would make anyone’s nerd antenna stand up. Great review! I may have to check this one out. Hah hah, my nerd antennae definitely quivered when I saw that description! I confess that I have yet to read Rick Riordan, but I have friends who really enjoyed that, so I must give them a go sometime. Thanks for stopping by! I find flashbacks rarely work well for me, but I really like the sound of this one otherwise (and MG isn’t always my thing!). The concepts here are definitely intriguing, and I can’t resist after the Star Trek comparisons. It’s also exciting to hear that it’s been optioned for film. Lovely review, Wendy! Same here, Sam–and it’s difficult if there are a great number of flashbacks, especially in a relatively short book. But the story is appealing, and it is promising that there are such good people behind the potential film! I’m a little cynical about film options, but when the producers have a good track record with films/adaptations I’ve liked, that’s a different story. And hah, I love that I’m seeing people who are Trek fans. I had no idea there were so many lurking amongst friends! Awww, this is going to be at BEA, and I’ll see if I can nab a copy, though I think the signing might be at an inconvenient time. Anyway, it sounds very cute, and I’ll try to get my hands on it if I can. My parents are HUGE Star Trek fans, so it sounds like it might make a nice present, even though it would be weird to give my parents a middle grade book. Whatever, if something’s awesome, it’s awesome. I hope you find a copy at BEA! Hopefully they’ll have copies out even if you can’t make it to the signing. Although I hear Dan is pretty great to talk to in person. I am also a huge fan of Dan’s YA novel, False Memory, and as such I have an urge to devour anything he has written! I’d be very curious to hear what you think of this one, Gwenyth! I’m not entirely sure adult readers will find it as engrossing as the target age group, but it’s definitely fun and imaginatively written. This sounds really good!! I love the descriptiveness!! The Tremist sound creepy and awesome. Fabulous review Wendy!! I loved the way the Tremist are described! It’s pretty spooky. And I can totally picture it, so this is going to make for a fun movie. OMG, *facepalm* I fudged the rafflecopter. I commented on this second post. And here is the link for my tweet. No worries, Viv. :) (May I call you Viv?) Thanks for clarifying! I’m not a huge sci fi fan but MG sci fi tends to work for me because it usually has a more fun undertone. Love the quotes that you used.Too bad the flashbacks disjointed you a bit, I have been finding that with a few reads lately as well. Great review, Wendy! Yeah, I would have preferred some restructuring to provide us with back story–there were too many instances where something exciting was happening, but then we’d have to break for history. I understand why the book starts out where it does to place us in the middle of the action, and flashbacks couldn’t have been avoided completely–but a little more finessing definitely would have kept the momentum going better. This might be a good one to read with your kids when they’re a little older, Jenni–it’s very “boy saves the world” with nonstop action. :) I do enjoy middle grade books for the sense of fun that you describe! I do love this author. Like you said, he doesn’t talk down to kids and writes a great story! With those cliffhanger chapters, it makes it really hard to put down, too. From the very beginning of the book, I kept thinking that it was so nice it was written this without a “gee-whiz type” narrative which defines so many MG books, which is partly why I recommend it for kids on the older end of that spectrum. And yeah, he’s got that chapter cliffie nailed down–I remember LOVING those when I was that age!